Being the manager of the HRL All Stars comes with certain responsibilities. These duties include lineup decisions, pitching rotations, reserving hotels & cars, etc. 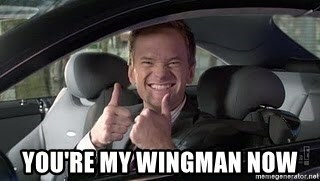 It also includes the ultimate responsibility: Team Wingman. For the convenience of the fine ladies of Morenci, Michigan, I have comprised a list and short profiles of the most eligible bachelors on the HRL’s national team. Disclaimer: Handsome Mat, Two Bat and Dr. Seuss are happily married, and Huck Finn is taken, so that group is off limits. We won’t be talking about them. Now it’s time to play a little game I like to call… haaaaaaaave you met the HRL All Stars? Leading off, we have Epstein. This kid has a heart of gold but is not without some swagger. When he was in high school, Epstein started a charity wiffle tournament to benefit the ALS foundation and has never once used it to try and win points with a girl (I’m here to change that). Not only is he a philanthropist, he’s also a former small (lawn mowing) business owner. Epstein has accomplished so much already in his young life; now the question is, who wants to get in on this flight as it starts to take off? Do you like autotune? Have you been on the lookout for a man who can take a popular top 40 song and turn it into an amusing parody video? If so, Mippey5 could be the one for you. He’ll dazzle you with his vast array of pitches, then leave you breathless with his hitting prowess. Did I mention this guy is a teacher? He set a team record for autographs signed at last year’s tournament, and will be looking to leave even more fans satisfied and smiling by the end of this weekend. Could one of those fans be you? Cougars beware, Showtime is coming to town. Weeks away from his sophomore year of college, he is looking to win big Sunday afternoon, and to party hard Sunday night. He’ll also be putting on a show at the All Star game Friday night if you want first dibs. He’s majoring in entrepreneurship, which means in a few short years, he could be your sugar daddy. Or better yet, you could be the mistake he talks about for years to come. Last but not least, we have Hardball. If living on the edge and driving around in three wheel vehicles that technically classify as motorcycles is your idea of a good time, then Hardball is your man. He’ll charm you with his wit, he’ll scare you a little bit with his jokes, and he’ll knock your socks off on the field. If you think you can take him down in a bowling, table tennis, or drinking competition, rest assured, you almost certainly cannot. For the right woman, he could be the man of your dreams. Or better yet, he could be the mistake you talk about for years to come. Hardball and I were attached at one point, but now I'm only attached to his alimony checks.